I listen to music every day of the week and it's almost like a therapy for me because it can seriously improve my mood straight away. 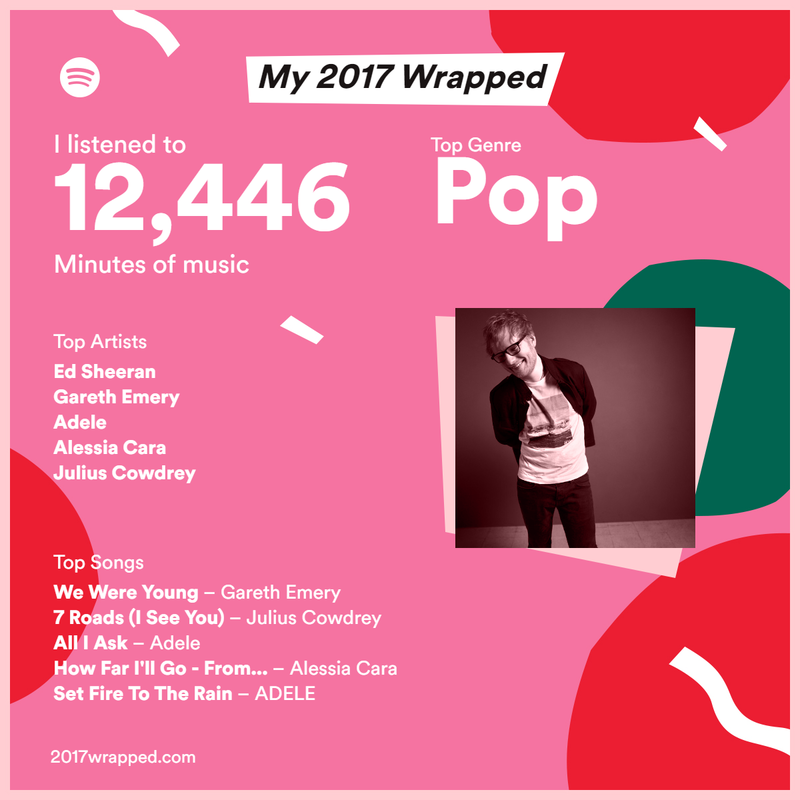 I love listening to and discovering different artists so thought since I found out my 2017 wrapped on Spotify I would share with you my top 15 songs of 2017. I bet not many of you have heard this song. I discovered it after listening to Alex & Sierra's playlist and I am still obsessed with it now. I love it because it's got acoustic vibes with added pop. I love it. I'm going to be honest with you, I was surprised that this made my top 2017 playlist but I must've gone through a phase of loving it! I like listening to acoustic songs and I discovered Julius after hearing his music on Made in Chelsea. If you've been following for a while you'll know that I LOVE Adele. My Mum and I went to see her live in London in July and it was honestly SO amazing. This song is absolutely beautiful and the lyrics are everything. This is just a tune. Simple as. I watched Moana on the plane to New York earlier this year and I loved it. This song is SO catchy so obviously I had it on repeat for the rest of the month!! Another Adele song, and what a brilliant one this is. When I was back at school our dance class performed to this song and it brings back so many memories. I love it. I discovered this after watching a YouTube Videos of the Gleam party last year and she is seriously amazing. I could honestly listen to this all day long. I love it so much. I don't really listen to Ariana Grande a lot, but sadly after the horrendous attack in Manchester earlier this year that happened during her concert, it led me to discover more of her music. This song brings out all the emotions and now every time I listen to it I think of those beautiful angels who lost their lives on that day. Another Ed Sheeran song, and another very catchy one. I think I know all the words to this song and could have it on repeat all day. I really want to see Ed in concert again because he is literally a musical genius. This song reminds me of festivals. It's so catchy and I love a bit of Tinie to give me a pick me up when I need cheering up! Ok so if you've not heard this song before - where have you been? I think I put this one once and then could not get the song out of my head. It is one of the most catchy songs, ever. I LOVE THIS SONG. If I'm getting ready for a night out I put this song on and dance around the kitchen like an absolute idiot. It's such a feel good song. I saw Craig David at V Festival last year and ever since I've been listening to his songs; whether that be old or new. I think this one is another really catchy one and great for listening to when getting ready for a night out. This is without a doubt one of the most beautiful songs ever. I love it. If you haven't listened to it and felt moved by the lyrics, I urge you to listen again. Jay and I saw Walking on Cars at V Festival last year and we loved them so much that we went to see them in Sheffield not long after. I love their music. Finally, another Walking on Cars tune. This is a little more upbeat than Speeding Cars and I love it. I was clearly obsessed with listening to the band before we went to see them live!! What were your songs of 2017? I'd love to know so I can discover some more artists.